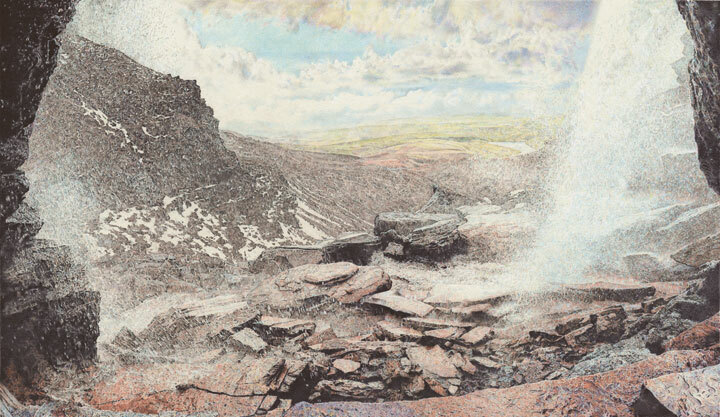 The title derives from the ancient origins of the name Kinder Scout, thought to arise from a combination of Old Norse “scuti” meaning over-hanging rock and Saxon, describing the fall of water over the rocky edge. A beautiful, even mystical place: it is familiar and yet retains an air of mystery. I have tried to get an unusual perspective from behind the curtain of water and captures the wind infused spray from the Downfall; blowing over the smooth, ice crusted rocks.